The beating of the bounds. The men referred to it as ‘his daily constitutional’ and fretted when he didn’t take it. They were superstitious. Everyone was superstitious. I haven’t read Life After Life, so I’m hoping that won’t matter and that this book will read well as a standalone. If you’ve read it what do you think? I just read this a few weeks ago. I loved it. The ending was a surprise but it probably shouldn’t have been. Looking forward to reading your thoughts once you finish it. I’m fascinated by the World War II era, so this book appeals to me. I’m adding it to my TBR list. I’d give anything Kate Atkinson writes a chance! I enjoyed both this book and Life After Life. They both stand alone very well so I don’t think reading this one first will be a problem. I’m not sure about this one for me, not grabbing me. Hope u enjoy it. Although I read Life After Life before this novel, I don’t believe that doing so enhanced the pleasure I found in this novel. I hope continue reading it and find it as emotionally rewarding as I did. However, I must tell you that months after finishing it I cannot forgive the author for using her authorial privilege in the way that you will discover for yourself. Wonderful story, incredible hero. Not sure, I loved her early books but Life after Life didn’t appeal to me so I never read it. Hope you enjoy it! I liked Life After Life and would keep reading. I have to confess, this is an Atkinson that I haven’t read, Margaret. But it certainly does sound good. And I really do like her work. I’ll be interested in what you think of it. I’m just beginning to read Life After Life for my library book club. Because this author is a favorite, I purchased my copy of this. It’s a long one, hope i can finish it in time. i’ve heard mixed reviews about this, some just love it, others detest it but it seems that everyone enjoys A God in Ruins. I just adore her writing so i’m confident that i will enjoy both books. Hope you enjoy, can’t wait for your review! I don’t think it will make a jot of difference that you haven’t read Life After Life. And I thought this was the better book. The ending – well, I think it was meant to be a surprise, and should be. That is what makes half the pleasure of the book. You should read life after life first. I enjoyed Life After Life, but it wasn’t an easy read for me. 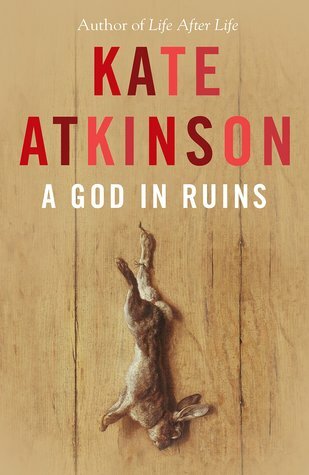 I have had God in Ruins almost since the day it came out, and am hoping to read it in Dec. The beginning sounds like Life After Life–yep, I would, and will, read on!